This Auto Dealer Privacy Notice Form ensures you are in compliance with all the latest requirements. You are required to provide a privacy notice to every customer concerning their non-public personal information obtained by you in a financial transaction. This form provides you with a simple and easy way to comply with these requirements. 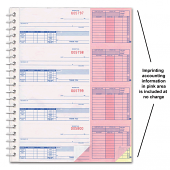 This form is very easy to use and provides the popular Opt-Out option for your customers. This Four Square Form/Customer Proposal provides an easy framework for negotiating a contract. The Test Drive Agreement Form is a great way to help protect you from damage or theft. If the Deal Recap Forms you currently use looks like this one, then it's compatible with your dealer management software systems. This is a 2-part carbonless form designed for computer or typewriter spacing. This deal recap form provides a complete breakdown of the entire deal. It includes a quick check list of items to be sure your documentation is complete; such as Truth in Lending, Appraisal, Odometer Statement, Insurance, etc. From selling price to gross profit all amounts are shown including: Trade Allowance, Payoff, Cash Deposit, Finance Reserve, Insurance, Service Contract, and all commissions paid on the deal.